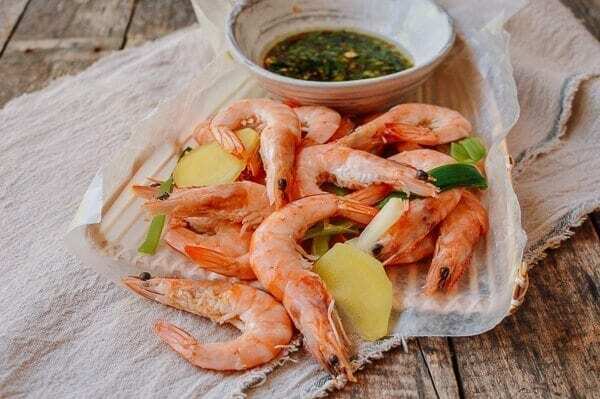 As the summer heat rises, this quick, crazy easy, and fabulous recipe, Boiled Shrimp with Ginger Scallion Dipping Sauce, will get you in and out of the kitchen quickly! 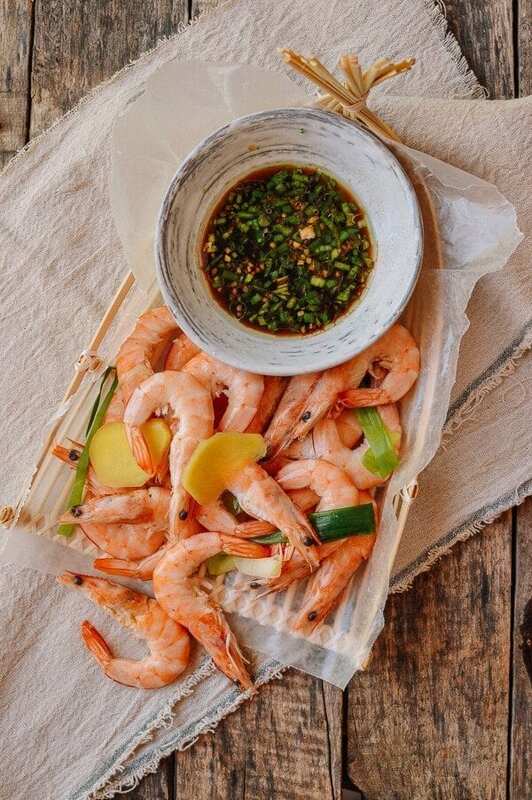 Most people are familiar with boiled shrimp (with cocktail sauce or maybe in a low country boil), but in Asian cooking, the shrimp is cooked very quickly, with the flavor delivery coming from the ginger scallion dipping sauce. 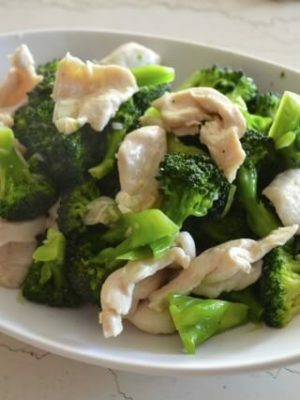 This is my version of this common dish. 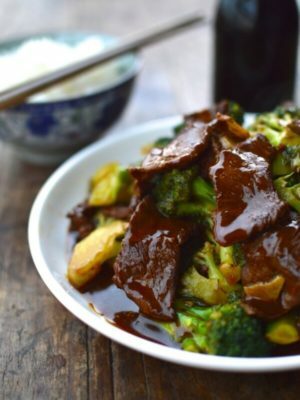 Most of the variation from region to region comes with the sauce, so feel free to change it to suit your own taste! Bill and I recently came back from a long stay in Shanghai, and I’ve learned a thing or two from my aunt. She used to make all of our clothes and shoes when I was young, and she is also a great cook. But now that she is older and retired, her cooking has definitely become simpler. We enjoyed a few meals at her house during this trip, and this poached shrimp dish is her specialty. Every time she made it, she would buy fresh live shrimp from the market. 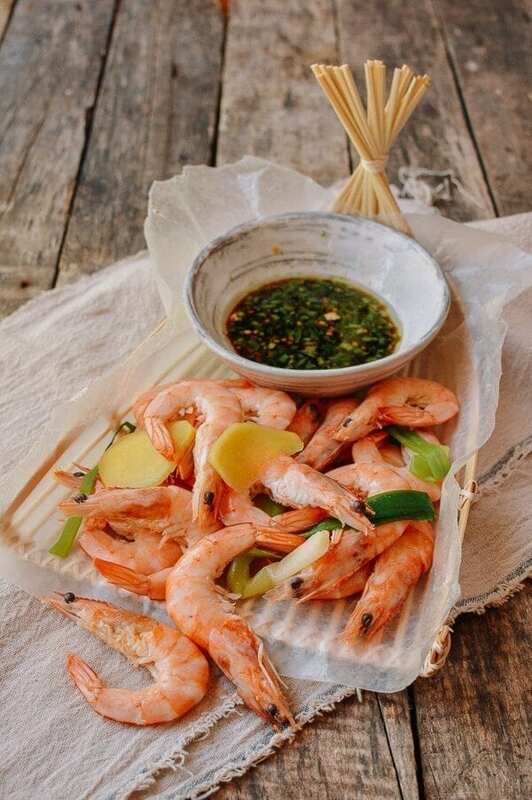 If you’re lucky enough to get your hands on fresh, never-frozen shrimp, definitely go for it! 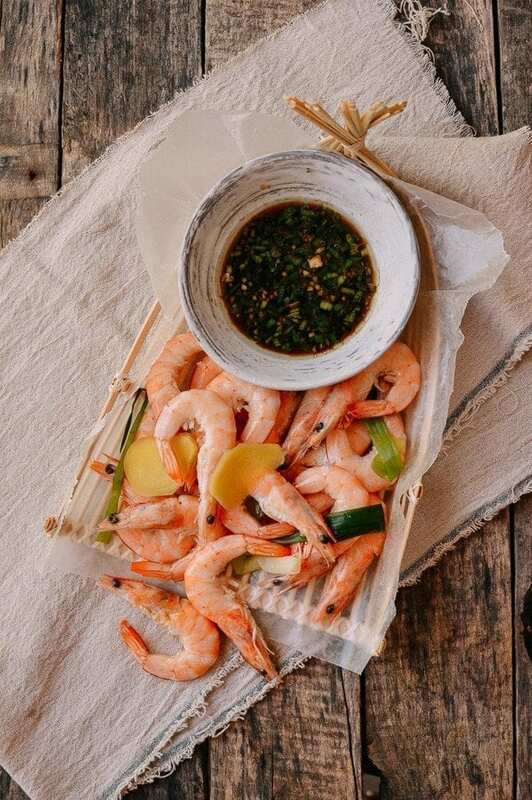 Since we don’t have easy access to live shrimp here in the States, the next best thing is a high quality frozen shrimp from your local supermarket. And here comes the really tough decision: heads on or heads off? 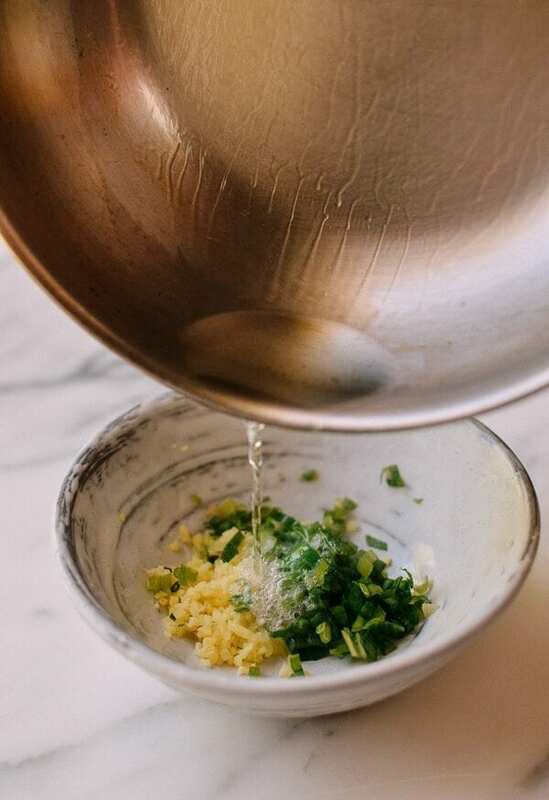 I do generally insist on using the heads-on shrimp for a lot of classic dishes like our Shanghai Shrimp Stir Fry and Salt and Pepper Shrimp, because the heads help to keep the shrimp moist during the cooking process. For this recipe, though, the trimmed shrimp will do just fine. 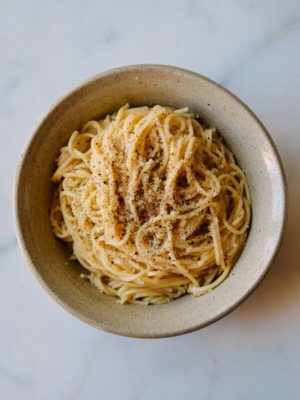 So now you have no excuse to not make this dish! 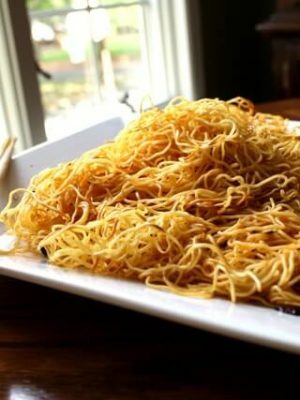 Prepare the dipping sauce first. 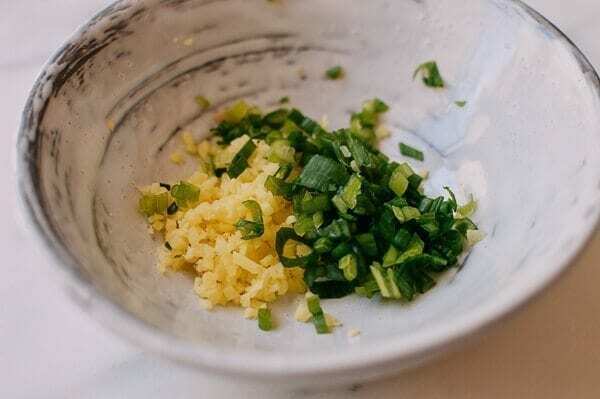 Mix the minced ginger and minced scallion in a small heat-proof bowl. 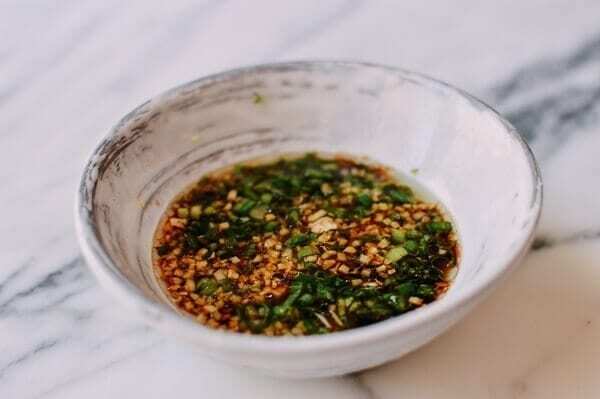 Heat up 1 tablespoon of oil until it just starts to smoke, and pour it over the ginger and scallion to flash fry the mixture. Now, add the light soy sauce, water, sugar and dark vinegar. Stir until the sugar is completely dissolved. That’s the sauce! 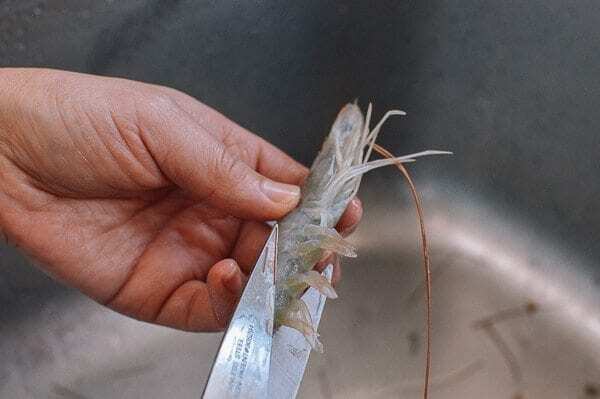 Next, trim, de-vein, and clean the shrimp as shown in the step-by-step photos. A good pair of kitchen shears will come in handy for this task! 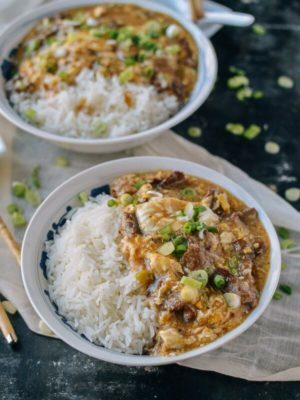 In a medium pot, add 5 cups of water, 3 slices of ginger, the 2 whole scallions, 1½ tablespoons salt, and 2 tablespoons Shaoxing wine. Bring the mixture to a boil. Add the shrimp and stir slowly. The shrimp will cook very fast, and they’re done once they’ve turned completely pink. It should only take a minute. 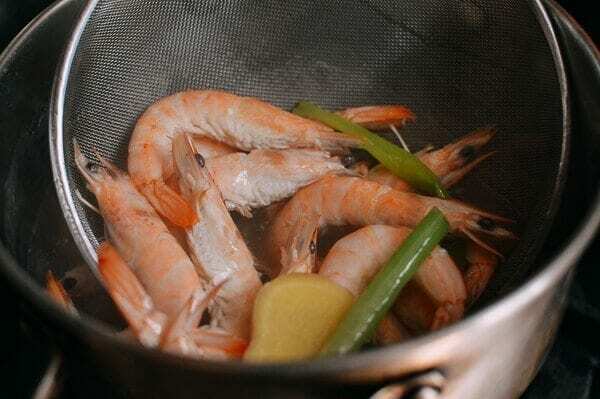 Scoop the shrimp out of the pot immediately to avoid overcooking. Plate and serve with the dipping sauce! 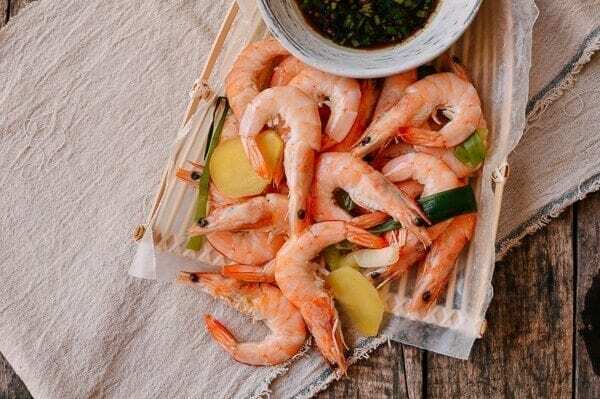 By the way, these shrimp are delicious fresh, at room temperature, and chilled, so this is perfect to make in advance for a party or dinner. 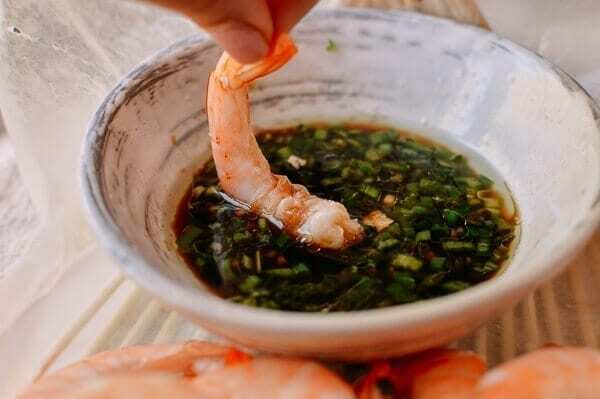 Chinese Boiled Shrimp with a Ginger Scallion Dipping Sauce, will get you in and out of the kitchen quickly! 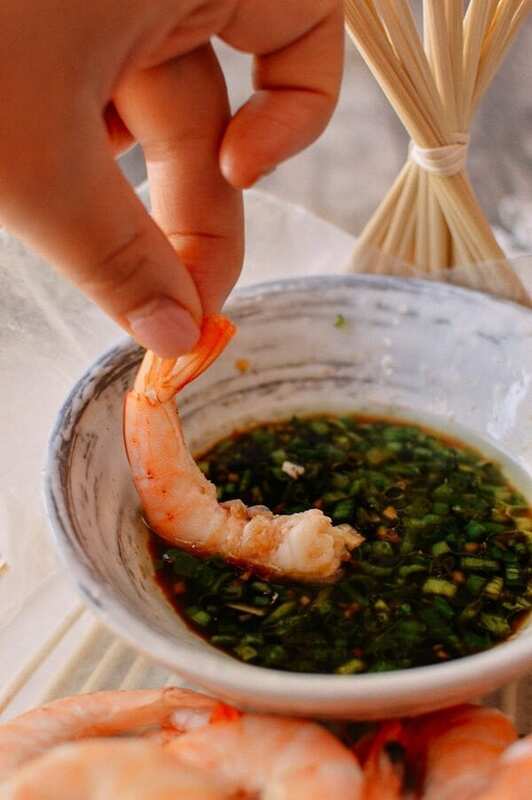 Use this Chinese boiled shrimp recipe and serve the ginger scallion dipping sauce right alongside your usual red cocktail sauce. Prepare the dipping sauce first. 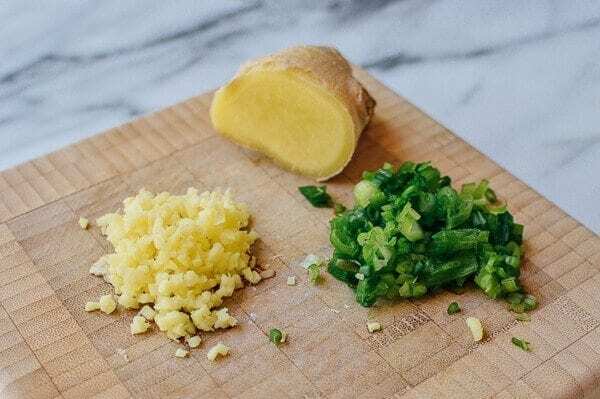 Mix the minced ginger and minced scallion in a small heat-proof bowl. 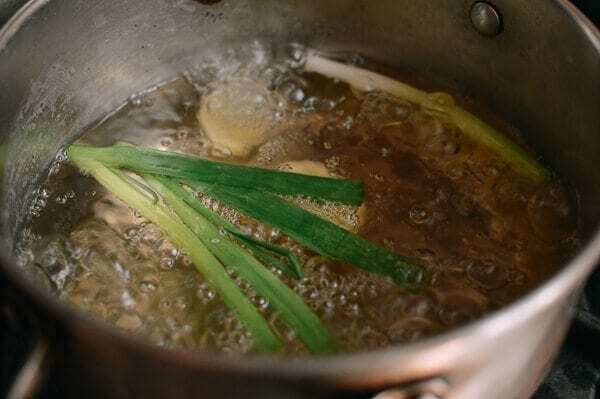 Heat up 1 tablespoon of oil until it just starts to smoke, and pour it over the ginger and scallion to flash fry the mixture. Now, add the light soy sauce, water, sugar and dark vinegar. Stir until the sugar is completely dissolved. That’s the sauce! 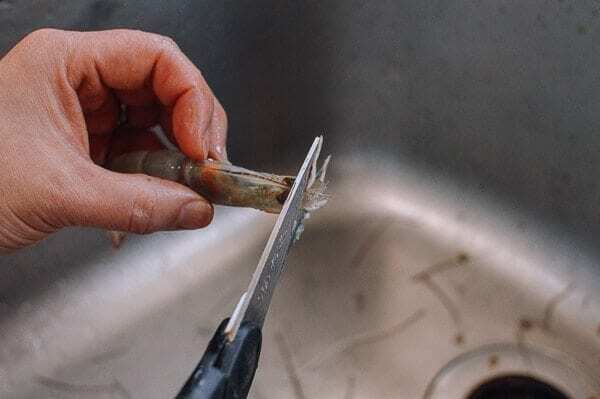 Next, trim, de-vein, and clean the shrimp as shown in the step-by-step photos. Rinse, drain and set aside. 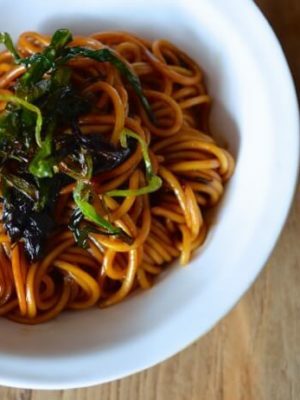 In a medium pot, add 5 cups of water, 3 slices of ginger, the 2 whole scallions, 1½ tablespoons salt, and 2 tablespoons Shaoxing wine. Bring the mixture to a boil. Add the shrimp and stir slowly. The shrimp will cook very fast, and they’re done once they’ve turned completely pink. It should only take a minute. 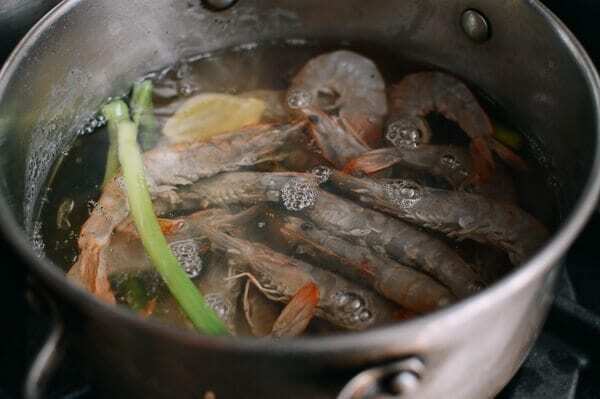 Scoop the shrimp out of the pot immediately to avoid overcooking. Plate and serve with the dipping sauce! 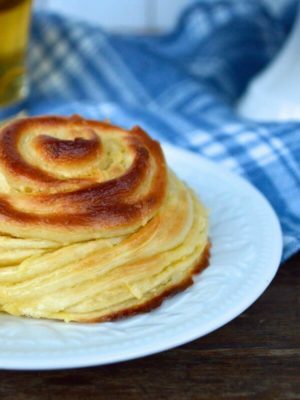 I want to tell you this is off-the-chart amazing flavors brought together! I think i could drink the sauce if there was any left over!! haha. One thing that worked nicely was to get the sugar in early to the mix with the hot oil before adding liquids so it dissolves super easy. 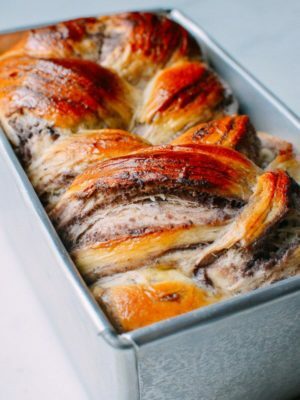 This is absolutely amazing as are so many of your recipes. 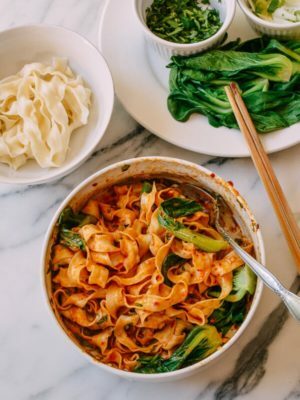 You are my go to for chinese recipes! Thank you so much for this amazing site! That’s awesome, John. 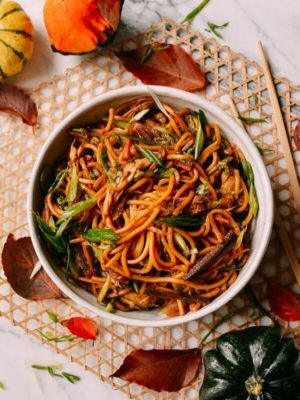 We have a lot of yummy recipes for you to try, happy wokking! Loved it! I figured my husband would love it and I was taking one for the team, but we both thought it was amazing. And my toddler finished his plate again! 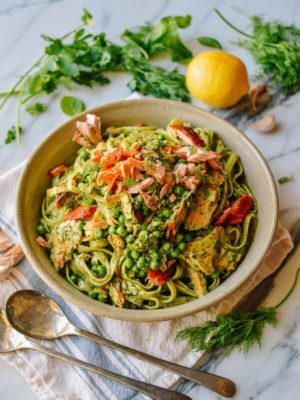 Your recipes have a 100% success for all 3 of us so far! Thank you so much for your report card, Anna! 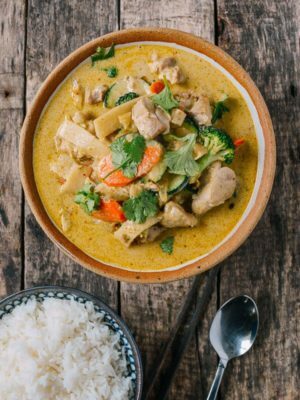 Keep on cooking. 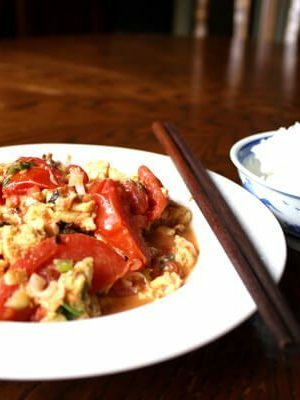 Would you recommend this for prawns w/o shells? You can, but I would not recommend it, Cindy. They will not be as juicy. So in the San Gabriel Valley we are getting live shrimp the size you get in Hong Kong. 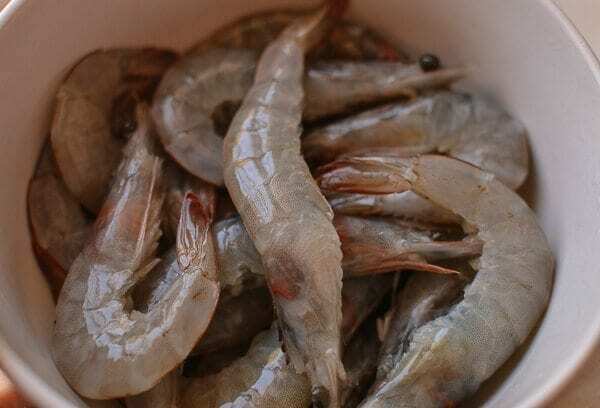 Does one just throw ypthe live shrimp and cook for a couple minutes? Yes, that’s what you do, John!